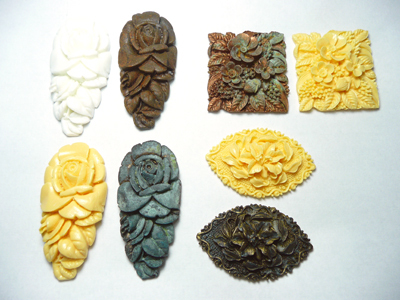 I chose three resin and one plastic cluster to use with four different Swellegant metal paints and 3 different Swellegant patinas. 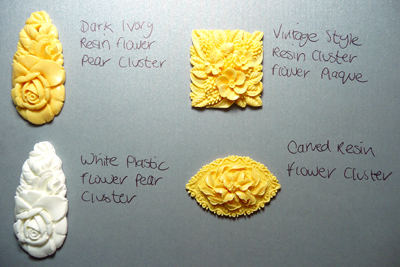 These resin clusters have some great detail and I was looking forward to seeing them turned into metal with patina. 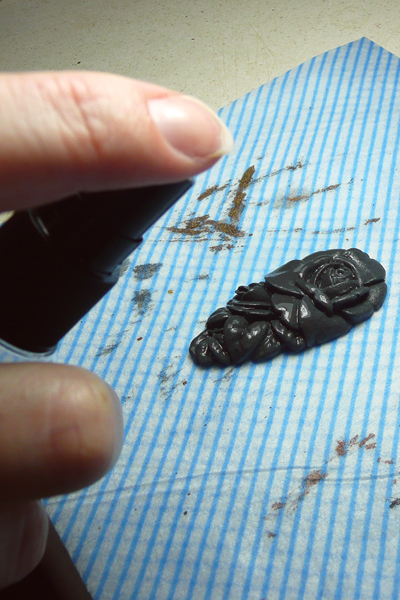 Firstly wash the resin pieces in warm soapy water to shift any grease, dust or fingermarks that will repel the paint. Rinse then dry very thoroughly. Any holes required should be drilled prior to painting. Apply your first layer of Swellegant metal paint . Don't worry if it looks patchy or thin at this point - it will become more opaque as the paint layers build up. Once dry paint on a second coat. Use thin coats otherwise the paint will clog up the fine details and also take an age to dry. Once dry paint on a 3rd coat - by now the coverage should be consistent. Don't forget to dab into the detailed sections and also paint around the edges . 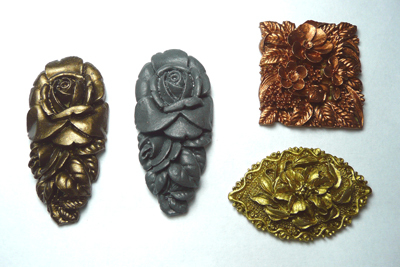 You can paint the reverse too if you wish - depending on what you will be using the resins for. I found that the plastic cluster seemed to repel the paint a little more than the resin but results were the same at the conclusion. 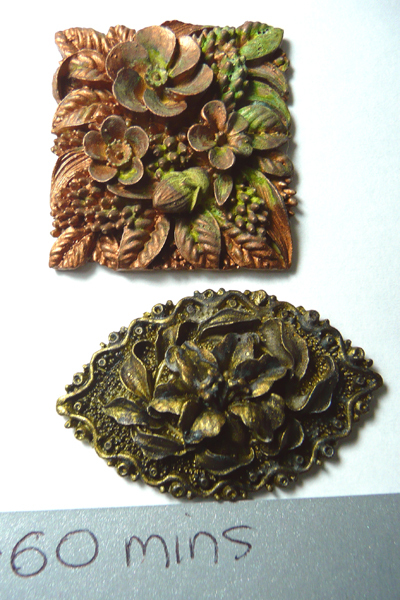 After 3 layers of paint the resins now look like metals .The bronze one looked particularly nice just as it is. 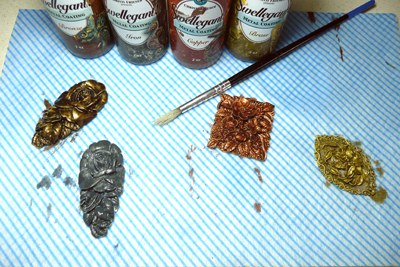 Paint on a dabbed 4th layer of paint and immediately while it is still wet apply your patina. This wet layer of paint is what the patina will react with. 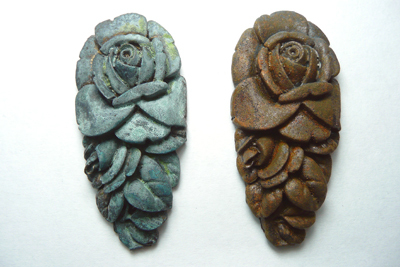 You can paint or dab on the patina , I prefer to use a spray bottle for a finer , more even coverage. Allow to dry and wait until you reach your desired effect. The times can vary I left mine for 2 full days to allow it to develop fully. When you are happy with the result rinse with water (to neutralise the effect) and allow to dry. 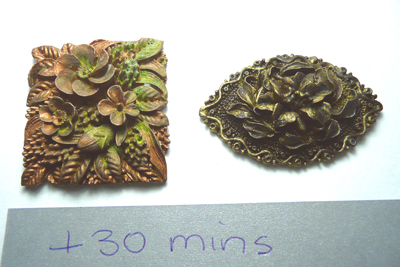 After 30 minutes have elapsed already the patina is showing clearly on the copper, the bronze and the darkening on the brass. 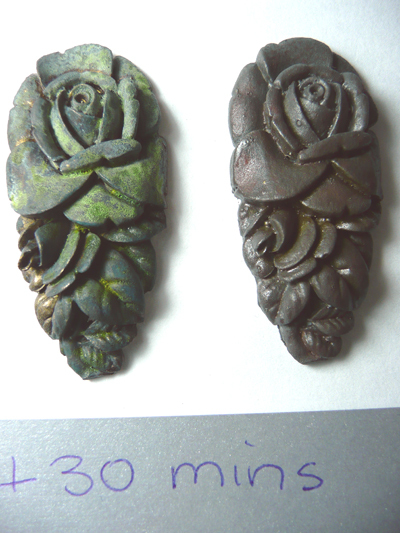 After an hour the patinas are more pronounced . The iron still remains pretty much the same at this point. 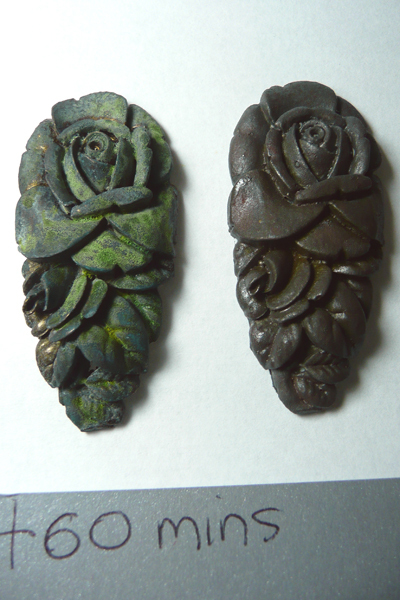 After 2 days there is bright verdigris and green on the bronze - barely any bronze colour remains, the copper has bright verdigris and looks very aged . 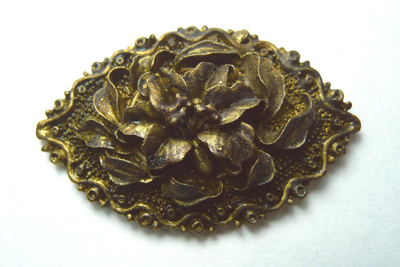 The brass looks truly darkened and old. 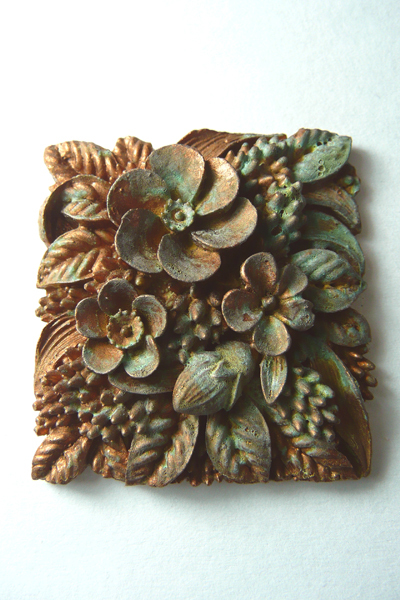 And finally the iron has a real rusty look to it! All that remains to do is seal using your choice of sealant - Swellegant sealer, renaissance wax or krylon spray.